Have delicious Nacho Cheese at your next party! This Nacho Cheese Dispenser is a simple push-button operation and is super clean. 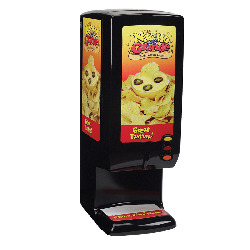 Rent Our Nacho Cheese Dispenser for your next party or event, it can get quite cheesy. This Nacho Cheese Dispenser is great for heating up and dispensing cheese for your nachos. Each bag of Cheese is good for up to 40 servings and comes with the 40 trays. Nacho Chips is NOT INCLUDED and should be provided by the Client. Client will need to supply: NACHO CHIPS. This unit requires one motor, which means we will need 1 electrical source within 50 feet of set up.